Elfie Begins the Annual Countdown to Christmas; Order Soon Before It’s Too Late! LONDON, 2016-Nov-24 — /EPR Network/ — The countdown to Christmas is once again speeding along at record pace, meaning now’s the time to get those perfect gifts prepped and readied. 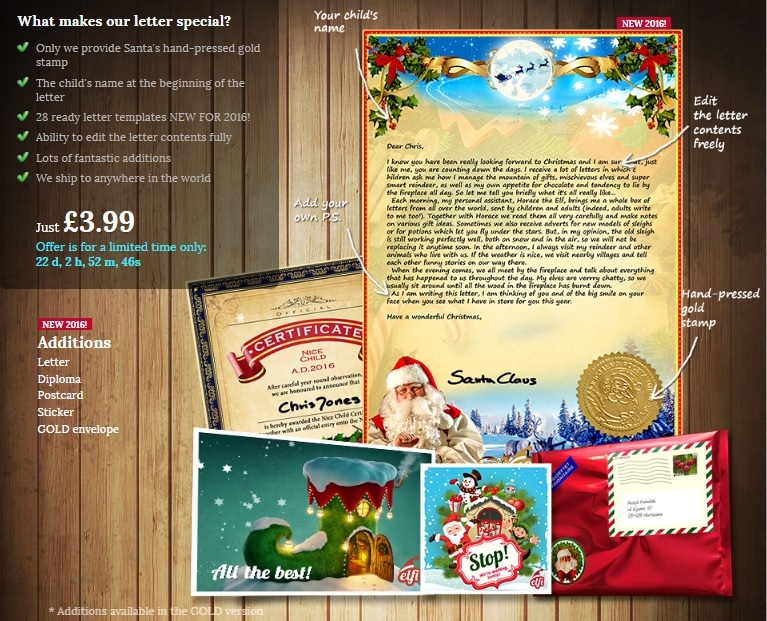 Over at Elfie, the world’s premier provider of enchanting Christmas messages directly from Santa himself is urging customers not to leave their orders too late! Time is running short and the countdown is on – place your order for a personalised message from Santa and make someone’s Christmas even more magical! There’s really nothing like a personal, heart-felt message from Santa himself to put that extra sparkle into the festive season. Adults and kids of all ages simply cannot resist the allure of a message from the big guy himself, though time is running out to place an order through his elves! Simply enter a few details online, after which Santa’s team will get busy preparing this incredible one-of-a-kind Christmas gift. When you see the face of the recipient light up on Christmas morning, you’ll understand the true magic of timeless, unique and sentimental gifts. Of course, there’s always the option of ordering a truly incredible video message from Santa, taking the whole experience to an even higher level. Whatever the message you’d like Saint Nick to deliver to someone special, you can be sure he’ll do so in the most magical way possible! From friends to family, kids to adults and all others in-between, it’s the kind of surprise they won’t see coming and will never forget! Once more, time is running out to get those orders placed…Santa and his elves are pretty busy right now! Don’t miss out on this incredible opportunity to make this festive season truly unforgettable for someone close to you! Elfie is staffed by a group of life-long Christmas fanatics with one goal – to amaze, astound and delight with unique personalised gifts. Since 2013, the Elfie team have been creating and delivering truly exceptional written and video-recorded messages from Santa Claus, making the perfect Christmas gift for family, friends, children and adults of all ages. Their commitment to going the extra mile to deliver truly captivating results has earned the Elfie brand an international reputation for superior quality and value for money.